The Destination A/T with UNI-T is Firestone's Off-Road All-Terrain tire developed to meet the needs of light truck drivers who desire the look & performance needed for on- & off-road driving. Destination A/T tires are designed to blend an aggressive all-terrain tread design with a smooth, quiet ride for sport utility vehicles & pickup trucks while providing year-round traction, even in snow. The Destination A/T uses Firestone's UNI-T technology to combine off-road traction with enhanced on-road capabilities. UNI-T is a combination of technologies that merge a comprehensive design method with innovative manufacturing features to enhance tire comfort, performance & wear. On the outside, the Destination A/T features a Long Link Carbon (a special form of carbon black) enhanced tread compound to improve wet performance & wear on the road while maintaining cut, tear & abrasion resistance off the road. The tread compound is molded into a symmetric pattern that features an over-the-shoulder design, independent tread blocks & a continuous center rib to combine off-road traction with enhanced highway stability while circumferential grooves, lateral notches & sipes help increase stormy weather traction. On the inside, the Destination A/T combines twin, high-tensile steel cord belts with a polyester cord body to enhance strength & durability. 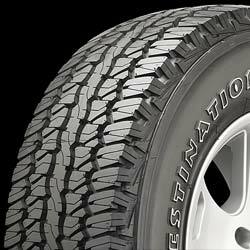 Firestone Destination A/T tires feature outline white letter styling (with the exception of the black letter P235/75R15 108S Extra Load size). They are available in R- or S-speed rated, 70- & 75-series P-metric & LT-metric sizes, as well as selected Flotation sizes to fit 14" through 17" diameter wheels.